When faced with a ’human error’ problem, you may be tempted to ask 'Why didn’t these people watch out better?' Or, 'How can I get my people more engaged in safety?' You might think you can solve your safety problems by telling your people to be more careful, by reprimanding the miscreants, by issuing a new rule or procedure and demanding compliance. These are all expressions of 'The Bad Apple Theory' where you believe your system is basically safe if it were not for those few unreliable people in it. Building on its successful predecessors, the third edition of The Field Guide to Understanding ’Human Error’ will help you understand a new way of dealing with a perceived 'human error' problem in your organization. It will help you trace how your organization juggles inherent trade-offs between safety and other pressures and expectations, suggesting that you are not the custodian of an already safe system. It will encourage you to start looking more closely at the performance that others may still call 'human error', allowing you to discover how your people create safety through practice, at all levels of your organization, mostly successfully, under the pressure of resource constraints and multiple conflicting goals. 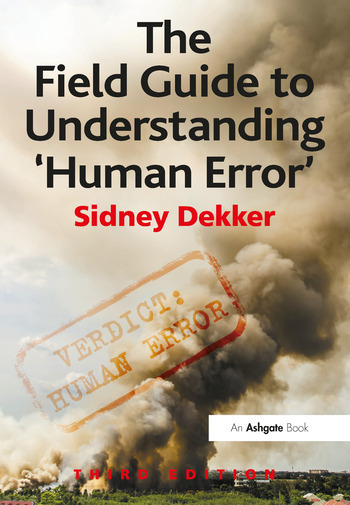 The Field Guide to Understanding 'Human Error' will help you understand how to move beyond 'human error'; how to understand accidents; how to do better investigations; how to understand and improve your safety work. You will be invited to think creatively and differently about the safety issues you and your organization face. In each, you will find possibilities for a new language, for different concepts, and for new leverage points to influence your own thinking and practice, as well as that of your colleagues and organization. If you are faced with a ’human error’ problem, abandon the fallacy of a quick fix. Read this book. Sidney Dekker (PhD Ohio State University, USA, 1996) is currently professor at Griffith University in Brisbane, Australia, where he runs the Safety Science Innovation Lab. He is also Professor (Hon.) of psychology at The University of Queensland, and Professor (Hon.) of human factors and patient safety at the Royal Children's Hospital in Brisbane. Previously, Sidney was Professor of human factors and system safety at Lund University in Sweden. After becoming full professor, he learned to fly the Boeing 737, working part-time as an airline pilot out of Copenhagen. Sidney is the best-selling author of a multitude of human factors and safety books, including, most recently, Safety Differently (2014), Second Victim (2013), Just Culture (2012), Drift into Failure (2011), and Patient Safety (2011).